I know I'm majorly late on posting this but I still think it's good to share how I'm inspired so here it is anyway. Better late than never, right? it better be a double dose of awesome! So needless to say I've put it off for a while (Side note: Thanks Jessica Mae Photo for taking the sweetest pics of Quinn). After making some rather large goals for Petal in 2013 that I was, per the norm, falling behind on, I set out to find a flower school when I stumbled upon Little Flower School. They only offer a few classes usually in the Spring and again in the Fall and it was July at the time so I crossed my fingers and signed up for their mailing list to hear about opening classes. A couple months went by and I honestly forgot about it. Things like having a 5 month old baby, going to visit family in Arkansas with the baby, building a new home, owning and operating a flower business in the Summer, and a part time event planning job had kept me on my toes. 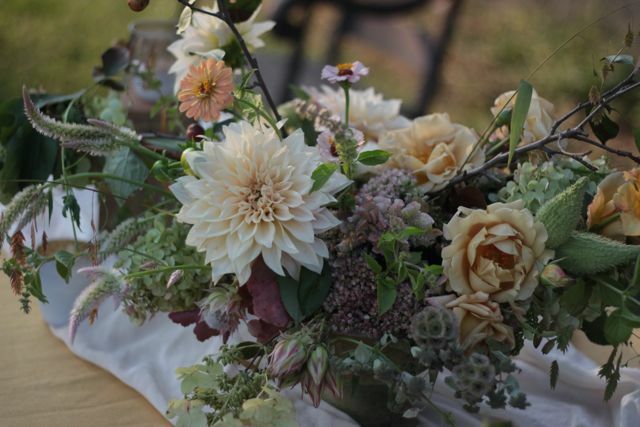 Fast forward to September when the stars aligned and I am standing in a barn that's 100 degrees in Gainesville, VA with about 10 other amazingly talented florists on the most quaint family owned flower farm. The pure sight of the flowers unarranged took my breath away. Like a dream, the two days were a whirlwind of lessons on bouquet making, color composition, visiting a Dahlia farm, containers, tricks and tips (like using a lazy susan when you make arrangements so your centerpiece looks good all the way around for those of us who struggle with having 2 sided arrangements...I slowly raise my hand joining this shamed group), ribboning, small arrangements, large arrangements, quotes, consultations, you name it, we talked about it or made it. I met the most amazing women from all over the world that are completely endearing. Flora from London who just decided to sell her clothing brand and take up flowers and oh, by the way, was in British Vogue for her flowers...who are these people?!? 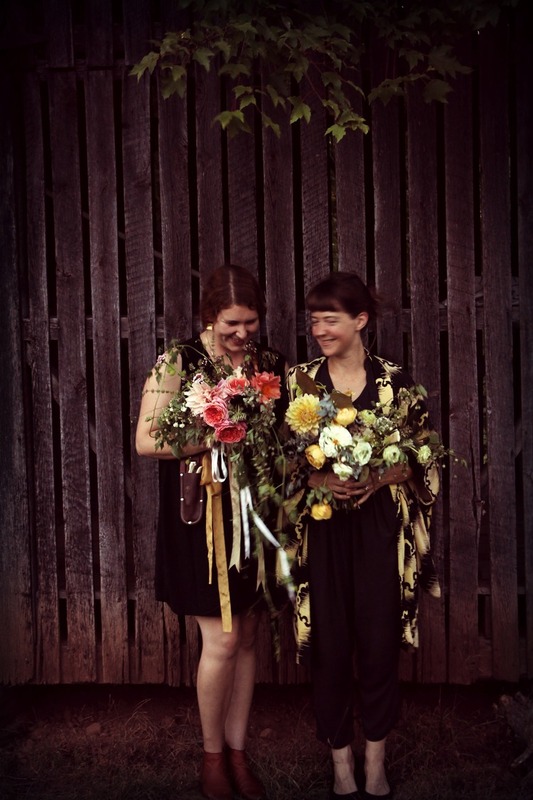 and Lindel from Australia who owns the best named flower shop ever, The Flower Dispensary. Both and many others will forever be in my hearts after this trip. Not to mention I learned from the best, Nicolette and Sarah. It was exactly what I needed. First of all, I learned a lot. I got to meet people who cared to talk about flowers as much as I did, if not MORE! If that's even possible. I mean, bless my husband's heart but he doesn't care about the exact nuances of the hundreds of Dahlia's and all their shapes, sizes, and colors, but they did. Every, last, one, of, them. I was inspired, and I left feeling ready to go home and practice what I had learned. I would consider this one of those rare moments in your life that you wind up in a random place, all on your own, and you're scared and anxious because you don't know what to expect, with so many doubts running through your head like, "I've never had any training before...what if they laugh me out of this barn and tell me to go back to flowers 101?" but it was an experience of a life time and I'm a better florist now because of it. I took away many things from this workshop but the thing I'm most proud of is the focus on local farms and product. Making every effort to use native flowers that are in season, that don't come with pesticides on them that are so unsafe for dogs and kids, which I have lurking around every corner in my house these days, Creating organic, orbiting, arrangements with movement that catches your eye and moves you from stem to stem like a piece of art. Being a florist now is truly an art form. It's not telaflorall...Please don't. It's unique and the extra hours it takes to hunt down these local farms in the back woods of Virginia, and trust me when I say it takes a lot of time and gas to find them and make pick ups instead of it being shipped to your front door in a box, makes those arrangements that much more coveted. And I also learned that dead flowers are "in"...you heard it right. Apparently, the most upwardly mobile florists have clients who pay lots of money for them to make gorgeous arrangements, let them die, and then they want them. I don't get it and I'm about 100% positive that I won't have a rush of brides in central Virginia beating down my door for the "dead flower look" for their wedding day. Here are some more pictures from my time at Lynvale Farm at the Little Flower School out of Brooklyn New York but visiting the outskirts of Washington D.C. This is my centerpiece above. One of my favorite flowers, blushing bride protea on the left and the fan favorite on the right, gorgeous garden roses from California. Hello gorgeous bouquet Sarah whipped up! This was from my centerpiece and bouquet photo shoot that I made during the workshop. And I'm not trying to brag or anything but, Ahem... we had dinner at sunset in the middle of the flower field at the end of our second day to conclude the workshop (I know...no words, like out of a flowertale) and the head waiter picked my arrangement out of everyone's to put in the middle of the table for dinner! I was beaming the entire time...I think I willed him to pick mine. Except for the fact that our instructors sat right in front of it the whole time and all I could think about was how they were probably examining it and thinking about how they would change it. But other than that, how freaking AWESOME is that?! This is the biggest Hydrangea you've ever seen in your entire life and you know they're good because you can cut them and they don't shrivel up and die the second they aren't any water anymore. No, these babies you can dry and they come in the most beautiful antique pink and green and whites. This was at our field trip to Wollam Gardens where we met Bob Wollam famous for his show Dahlias. You heard me right, show Dahlias. photo by Saipua.